Each spring, a nation-wide high school arts competition is sponsored by the Members of the U.S. House of Representatives. 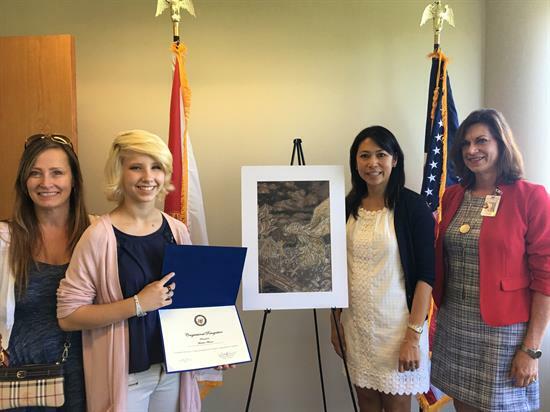 The Congressional Art Competition is an opportunity to recognize and encourage the artistic talent of students in central Florida and across the nation. The Congressional Art Competition is open to all high school students from participating congressional districts. The winning artwork from our district's competition will be displayed for one year in the U.S. Capitol alongside the winning artwork from all participating districts and will be featured on the Congressional Art Competition webpage. Artwork must be submitted with a student release form by April 30, 2019 to one of Congresswoman Murphy’s district offices; in Orlando, located at 225 E Robinson St, Ste 525, or Sanford, located at 110 W First St, Ste 210, during regular business hours.